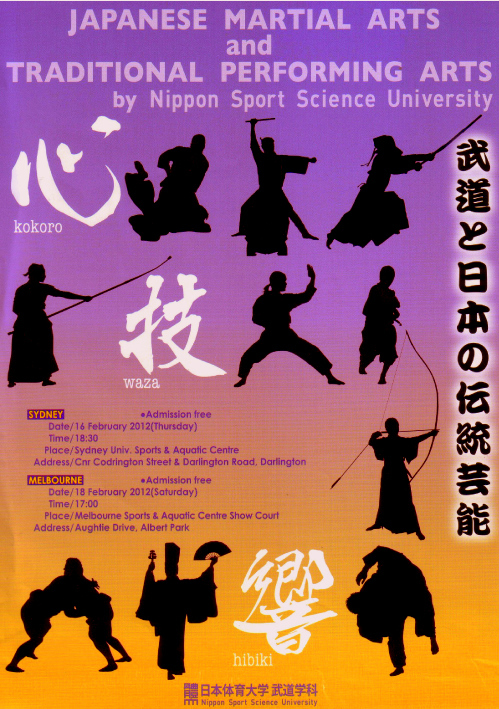 Nittaidai are making their annual visit to Melbourne on 18 and 19 February. Everyone is encouraged to see their demonstration at MSAC in Albert Park on the Saturday afternoon (after the beginners' course starts). Then on Sunday morning at Kenshikan, there will be a special training with the Nittaidai Kendo Dept from 9.30 until 11.30 followed by lunch. Anyone who is wearing bogu can attend that training and I highly recommend you do. There will be 35 students and 2 students from Nittaidai in attendance. These are students whose Kendo was so good in High School that they decided to become Kendo Instructors, and they are studying at Nittaidai with Kendo as their major. The demonstration on the Saturday will also feature (as in previous years): Judo, Sumo, Karate, Shorinji Kenpo, Naginata, Kyudo and Taiko Drumming. Click on the image above for a big version.